I often hear from you about how you love my recipes--you're sweet to say so--so one of my goals this year is to give you more food posts. I have so many great ideas that I want to share with you, and you all seem to like them, so I figure why not? Truth be told, I've been waiting for Downton Abbey to end (*sob*) so that I can move on to other (ahem--more serious--ahem) writing. Now that we're getting closer--Sunday is the finale, folks--I thought I'd share something delicious that you can make this weekend. Maybe you could even enjoy this while you watch the Downton finale. I've written about short ribs before. Short ribs are one of my favorite cuts of meat. Most often they come with the bones, which, I'm sure, would give you a richer, more flavorful dish than this one even is, although that's hard to believe. But I'm all for shortcuts--and no bones--so I get my short ribs at Costco where they come boneless. I think you get more bang for the buck if you buy the boneless ones anyway. In fact, this recipe will make a delicious meal for your family and will leave enough to give away to a friend. The first time I had a ragu was, I think, in Italy this past summer. And then I had it at an Italian restaurant in Chicago a couple of times this fall. I wasn't familiar with what a ragu even was, but I've since learned that it's basically a slow roasted meat sauce that can be made from beef, pork, or veal. It's braised for several hours so that the mean pulls apart, and then it is served over pappardelle or polenta. This has easily become one of my favorite dishes. It's SO good. Over Christmas, Kate and I decided to try making ragu for ourselves, and it turned out so well that Julia requested it for her birthday in February. I've made it a few times this winter because it's delicious, easy, and it makes a lot. This is comfort food at its finest. So pull out your favorite cast iron dutch oven and let's get cooking! First, you'll need some vegetables and herbs. The holy trinity should do you just fine. And maybe some shallots if you have them. And garlic. Chop those up into fairly small pieces and set them aside. Next, you need your short ribs. It's helpful if you pat them dry with a paper towel, then sprinkle them generously with salt and pepper before placing them in your heated pot with plenty of olive oil. And maybe a little butter to make everything brown and yummy. 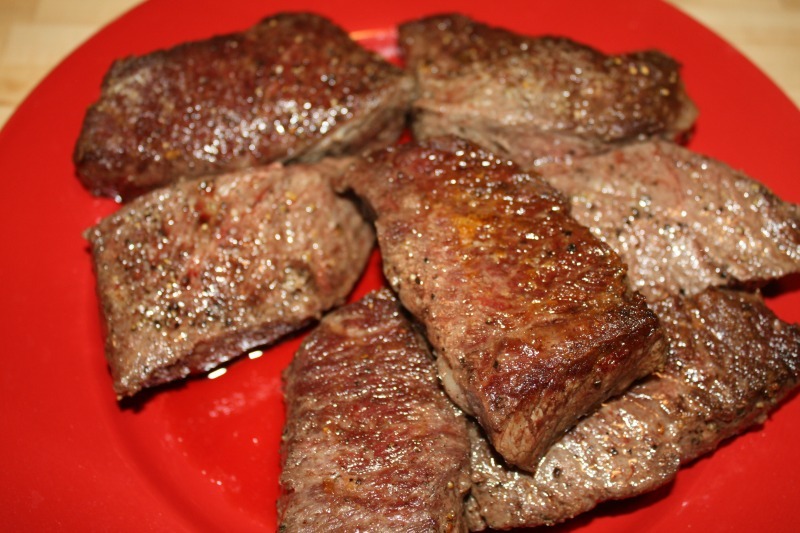 Brown the meat on both sides and then set the pieces aside on a plate. You might have to do this in a couple of batches. See how brown and delicious this looks already? Just wait . 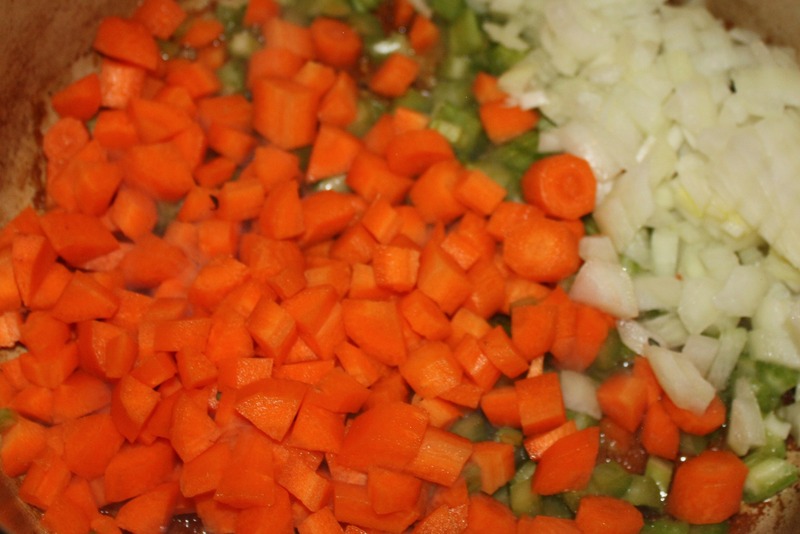 . .
Next, add the vegetables to the pot and brown them for several minutes until they are soft and caramelized. Add the garlic at the last minute so that it doesn't burn. Next add a couple of cups of red wine to the vegetables and let that simmer for about five minutes until the wine is reduced by half. See how rich this is getting?! I'm licking my lips just thinking about it. 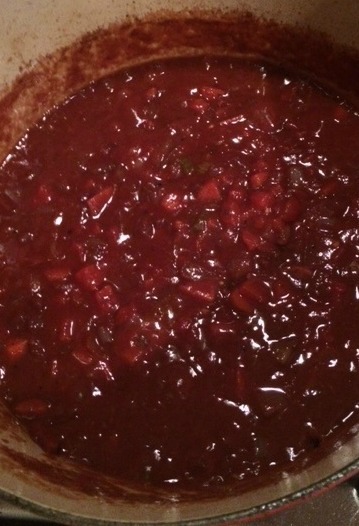 Next add a can of crushed tomatoes and about 3-4 cups of beef stock. Place the meat back in the pan so that the juices cover all of the pieces of meat. Add some herbs--rosemary, thyme, and bay leaf should do it--then cover the whole thing, put it in the oven for about three hours, and forget about it. You'll know it's ready when the meat falls apart. 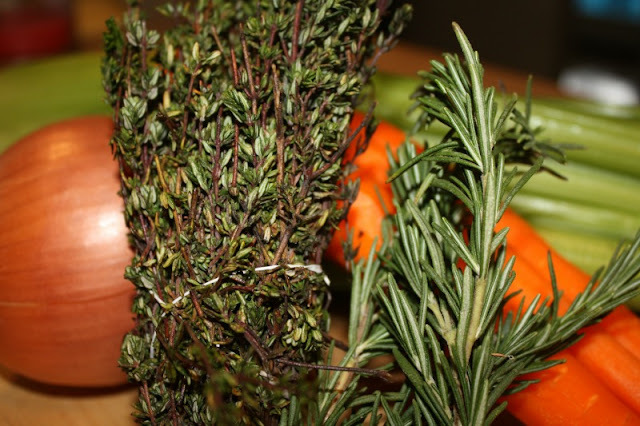 Remove the herbs from the pan and shred the meat very well--just use two forks and go to town. This shouldn't be too hard since the meat will be falling apart anyway. And that's it! 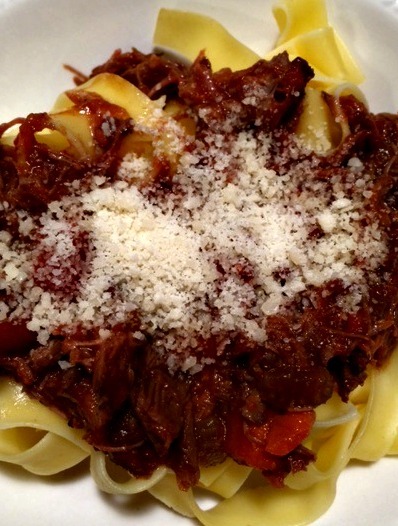 Serve the ragu over pappardelle noodles, like we did for Julia's birthday. 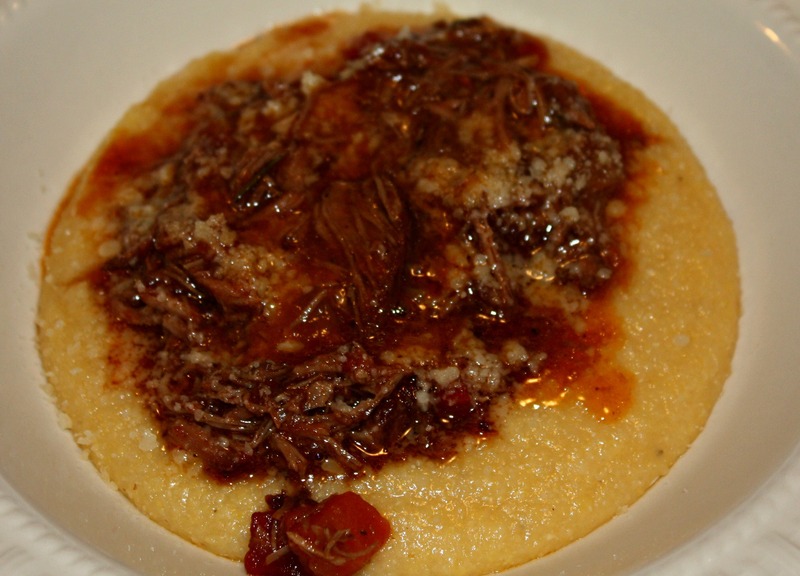 Or you can serve it over polenta, which we tried a couple of weeks ago and liked very much. Either way, you have GOT to try this recipe. You won't regret it. I promise. And if you don't like it, I'll come take it off your hands for you. Want a printable version of this recipe? Click here. Want to keep up with everything around here? Why not sign up to get email updates? You can subscribe just over on the right. Or follow me on Facebook and Instagram. Thanks so much! That looks HEAVENLY!!! I too love short ribs. They take some time but they are well worth it. I've never made polenta . . . . I think I need to branch out and try this!! Also, did I miss a post on your IF Gathering?? Anxious to hear all about it. Blessings to you from Missouri!